^ a b c d e f g "Ronne Ice Shelf". Geographic Names Information System. U.S. Geological Survey. Retrieved 2013年5月5日. 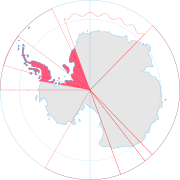 ^ a b "Filchner Ice Shelf". Geographic Names Information System. U.S. Geological Survey. Retrieved 2013年5月5日.